Northern Ireland as “The Beloved Community”: Pending the reunification of Ireland, Fr. Mc Manus urges in today’s Irish Echo that we should view Northern Ireland as The Beloved Community as it was taught by Blessed Martin Luther King, Jr. But that does not mean that we still cannot speak truth to power. Indeed, it demands we speak the truth. Fr. Sean Mc Manus. Irish Echo. New York City. In the meantime, I also believe the Good Friday Agreement is the proper way forward. And that, in effect, means seeing Northern Ireland as “The Beloved Community.” (Not too difficult for this Fermanagh-native to do). “For Dr. King, The Beloved Community was not a lofty utopian goal to be confused with the rapturous image of the Peaceable Kingdom, in which lions and lambs coexist in idyllic harmony. Rather, The Beloved Community was for him a realistic, achievable goal that could be attained by a critical mass of people committed to and trained in the philosophy and methods of nonviolence. 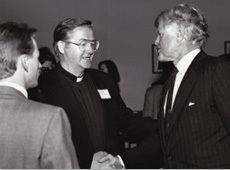 This— for the time being, pending the common-sense and inevitable reunification of Ireland— is the Northern Ireland that the Irish National Caucus has worked for since its inception on February 6, 1974, and for which it opened the very first Irish office on Capitol Hill on International Human Rights Day, December 10, 1978. Now, only the utterly naïve and those totally lacking in a knowledge of Irish history, not to mention British history, would think that this means one does not expose on-going injustice, human rights violations and anti-Catholic discrimination and bigotry in Northern Ireland. (Or perhaps the applicable phrase here is “useful idiots”—useful, that is, to the British Government). One person charged I was “too Catholic”; and at the same time, another person accused me of not being Catholic enough because I issued a statement supporting Michele Gildernew in her successful campaign to become MP again for Fermanagh/South Tyrone. 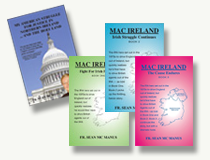 motto: “American dollars must not subsidize anti-Catholic discrimination in Northern Ireland.” … So now we are being told the Mac Bride Principles — the most successful Irish-American campaign for Irish justice since 1921— was “counterproductive to progress.” God help us all! Now back to The Beloved Community. That is what I want to see in all of Ireland, north, south, east and west. This is the final of three opeds penned in recent weeks for this page by Fr. Sean McManus, founder and president of the Washington, D.C.-based Irish National Caucus.